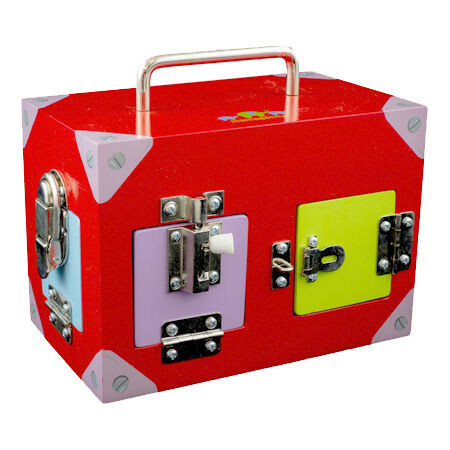 Small Red Wooden Lock Activity Box is six doors of opening, closing, locking, unlocking, twisting, fine motor skills fun. This Red Lock Box has one compartment which can be accessed from six coloured doors. The lovely sturdy metal handle makes it easy to carry around after you have stuffed it with treasures. Material: Wood, child-safe paint, metal locks, hinges, screws. We like this because: "A suberb toy wonderful for dexterity and cognitive development."